Global Optical Sensors Market size was valued at USD 15.4 billion in 2015, with 7.5% CAGR estimations from 2016 to 2024. These products are used for various advanced capabilities in smart homes, such as smart heating and lighting, perimeter security or touchless controls, occupancy sensing, smart appliances, presence detection and gesture recognition. The control status is readily available on personal computers, laptops & smartphones. Demand for commercial and residential surveillance systems owing to rising security among individuals is expected to catalyze global optical sensors market size. Integration of these products in security as well as surveillance systems aids in accurate perimeter intrusion monitoring, presence and movement detection for smart homes. Moreover, it aids in improvising lighting and heating systems, and also helps in cost optimization by efficiently reducing energy consumption. Additional features offered by these devices such as ambient background lighting, personnel distance, UV, and LED color detection is likely to help enhance user experience. Minimal power utilization and low carbon emissions from these systems will increase user interaction with electronic systems. Moreover, technological advancements in smartphone biometrics is expected to drive optical sensors market size over the forecast timeframe. Growing focus towards new features such as configuring fingerprint recognition for security and mobile payment authentication will offer potential growth avenues from 2016 to 2024. Image sensors market accounted for more than 50% of the overall optical sensors market share in 2015 and is forecast to grow at over 7.3% CAGR from 2016 to 2024. This can be attributed to their extensive usage across the consumer/personal electronics sector. High performance cameras in high end smartphones coupled with newer applications such as 3D mapping, restore recognition, eye tracking etc. is expected to favor the segment growth. Ambient light sensors in optical sensors market is estimated to grow at 7.9% CAGR from 2016 to 2024 owing to escalating integration of these devices in electronic devices such as tablets and mobile phones. Advent of wearable technology and need for integration in garments, belts, and other products will augment fiber optic sensors industry size. These textiles are primarily deployed to monitor daily activities such as heart rate, cardiac outputs, blood pressure, blood flow, and body temperature. Aerospace & defense sector in optical sensors market is anticipated to grow at 8.2% CAGR from 2016 to 2024, due to rising demand for superior detection capability products. Rising adoption of personal electronics including smartphones and other portable devices across emerging economies such as India and China may drive the consumer electronics segment. Healthcare providers focus on advanced biomedical instrumentation in order to offer patients with precise diagnosis, treatments, and monitoring. 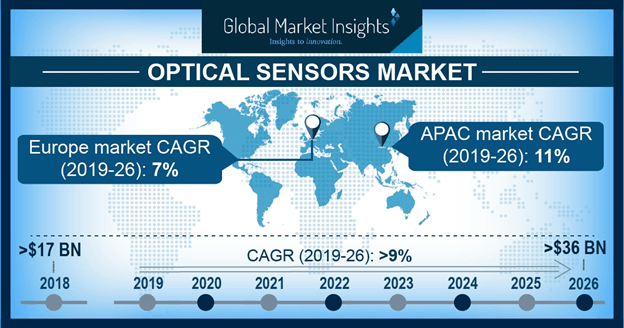 The optical sensors market is forecast to witness tremendous growth potential owing to increasing integration in high tech imaging devices. For instance, fiber optic device helps in detecting fatal lung in case of critical care patients. It also monitors blood flow in critically ill adults as well as babies and thus eradicates blood sampling need. Increasing adoption of healthcare platforms such as SPHERE helps in monitoring patient’s health which targets depression, obesity, stroke, falls, musculoskeletal as well as cardiovascular diseases. This, in turn is anticipated to fuel optical sensors market share over the forecast timeframe. Asia Pacific, mainly China, South Korea and India optical sensors market share accounted for over 30% of the revenue in 2015. Escalating demand for handheld as well as electronic systems is likely to drive regional growth through 2024. Untapped potential and steady demand in the region may contribute towards high growth rate. Rapid integration of these devices in smart control systems as well as factory automation may surge demand across the U.S.
High installation cost and sensing capabilities associated with materials are among major restraints in the optical sensors market. For instance, surging oil process may shift oil & gas companies focus towards fiber-optic sensors instead of conventional methods. These are used for maximizing resource extraction by monitoring pressure and temperatures in geothermal environments. Extremely high pressure and temperature along with corrosive chemicals and vibrations can damage the product. Thus, installation of fiber-optic cables involves huge investments in oil & gas industry, high-speed rail and automation industries. Major industry participants contributing to global optical sensors market share include Sony, Omnivision, Samsung, and Canon. Other prominent players are ABB, Analog Devices, Baumer Group, Broadcom, Coherent, Eaton, Emcore, Finisar, Omron, Robert Bosch, STMicroelectronics, and Sick AG. The industry is characterized by frequent mergers & acquisitions and new product development owing to surging demand for better quality, optimal performance as well as efficient products. From raw material providers to distribution vendors, many large corporations are acquiring companies or entering into partnerships to become integrated across the value chain. Key OEMs are entering into joint ventures and investing heavily to introduce innovative products to offer better connectivity solutions in harsh environments conditions in industrial, automation and oil & gas sector. For instance, in May 2015, Avago Technologies acquired Broadcom Incorporation to extend its portfolio in diversified communications platform in the semiconductors industry. Procurement of parts and materials by the OEMs is exposed to cause fluctuations in commodity prices resulting in profits or losses to manufacturers. Suppliers work closely with the manufacturers in order to manage the sustainability issues along with improving the performance throughout the supply chain. Innovation for developing more sustainable products for the end-users are being achieved by collaboration with component suppliers. Effective supply chain management benefits manufacturers in procuring raw materials for production process and having productive interactions with suppliers & customers. The distribution channel comprises distributors, dealers, stockiest and electronic retail outlets. Based on factors, such as convenience, cost, applications and industry characteristics, manufacturers select retailers and distributors to sell their products to end-users.